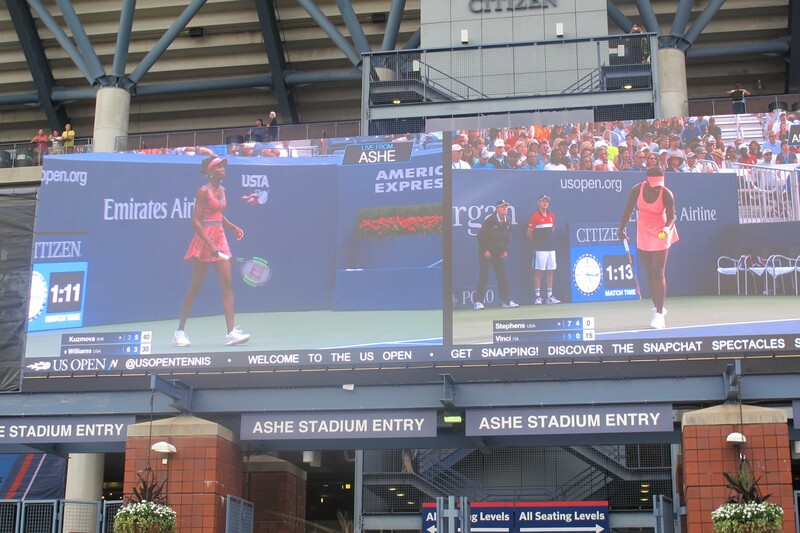 Since I started seriously watching tennis in 2012, I have gone to the US Open every year. I live in New Jersey, so Flushing Meadows is only about two hours away by train. Every year prior to this one, I have gone with friends or family to the US Open, but this year I decided to go by myself so I could really absorb as much of the tennis as possible. This year I attended the first day of the tournament, and I thought I could review my incredible time at the US Open here on Moo’s Tennis Blog. 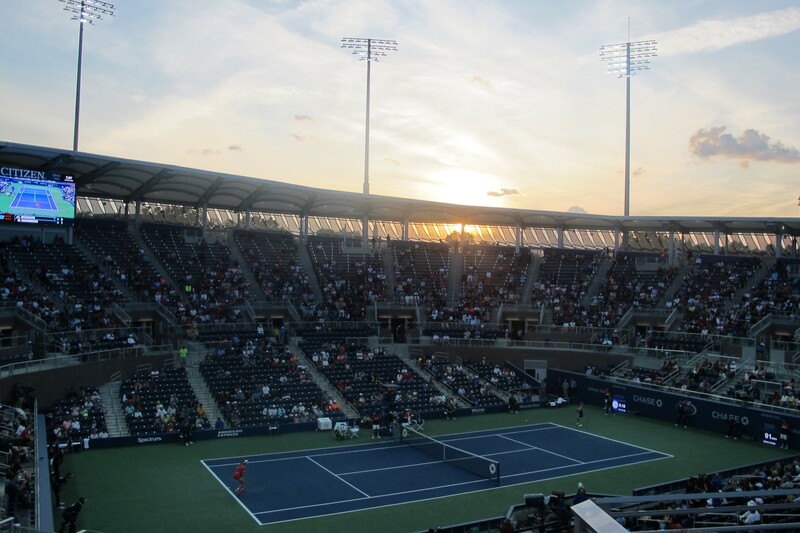 On the opening day, I arrived at the Billie Jean King National Tennis Center with a big camera around my neck. I was on a mission to take as many photos as possible. After walking around the grounds and watching some of the players practice before their matches, I settled down in the temporary Louis Armstrong stadium. The real Armstrong is currently being renovated, and it will have a roof next year. This temporary stadium was much smaller than the Louis Armstrong I was used to! It was nice though because there were some trees poking into the stadium, and they provided bits of shade for the viewers. The first match I saw at this year’s tournament was Petra Kvitova vs. Jelena Jankovic. This was my first time seeing Jankovic live, so I was excited to witness that stunning backhand. Both players received a big welcome to the stadium, and it was an entertaining battle throughout. The first five games went on serve, and the highlight of those games was Jankovic producing a stunning drop volley from behind the service line. Kvitova kept picking on the forehand though, and she broke through for a 5-2 lead. Suddenly, Kvitova seemed a step slow on a lot of balls, and Jankovic won a whole string of points to level up at 5-5. At 5-3, Jankovic produced yet another great shot; this time it was a reflex volley that sailed past Kvitova. Kvitova seemed to regain some focus at 5-5, and she took the last two games of the set with some forceful play. It was an engaging match on a unique court, but there was so much more tennis to be seen, so I left after the first set. Next I made my way over to Court 9, where Magdalena Rybarikova was taking on Camila Giorgi. There was a bit of a crowd around this court, but I saw a seat in the front row, and I knew I had to take advantage! I ended up pushing my way past a few people, and when I got to the open seat, I realized that it was reserved for the coaching team. One of the members of Rybarikova’s team gave me a strange look, and I awkwardly made my way back to the edge of the stands. This match was a classic example of a player with variety frustrating a power player. Giorgi produced stunning winners at times, but during some of the key points she missed a couple sitters at the net. Throughout the match I was scanning through the crowd, looking for Sergio (Giorgi’s father and coach), and I found at least two look-alikes, but not the man himself. Despite the immense Italian support on this court, Rybarikova was able to scrap her way to victory 6-3 6-4. After this match I went to my favorite part of the grounds: Courts 4, 5, and 6. From the stands, it’s possible to view three matches at once. Kevin Anderson was playing on Court 5, and I had to stop and watch as he served bombs. On Court 6, Sachia Vickery had just split sets with Natalia Vikhlyantseva. I only watched this match for a few minutes, but during that time Vikhlyantseva lost serve from 40-0 up. You could tell by the way she kept closing her eyes that she was really overwhelmed by how much the crowd was against her. I was sooo happy to see Alizé Cornet on Court 4. I arrived at 4-4 in the second set, and the last two games featured some great rallies. It was really fun to see Alizé go through her dramatics, and she ended up on the ground twice! Once was from missing a backhand pass, and the other was from missing a first serve. Only Alizé would squat down in disappointment after missing a first serve! I went back to Court 9 to see two players that I’ve never seen live: Kiki Bertens and Maria Sakkari. I am a low-key fan of Bertens, and I’ve been wanting to see her transfer her success on clay to other surfaces. Unfortunately, another first round exit was in store for her. However, Sakkari was absolutely cracking her forehand. Every time she hit it, there was such a great sound, and you could tell she was hitting it with the perfect amount of top spin. I needed a bit of a break from tennis so I decided to eat some lunch. This is my least favorite part of the US Open, because everything is so expensive! I promised myself that this year I would have a $20 budget on food, but I ended up spending about $40 on snacks throughout the day. I tuned into Konta vs. Krunic on Grandstand, which I have to say is such a beautiful court. When I arrived, Konta was 4-1 up in the first set. It was a fun watch, and I felt like Krunic loved doing splits! She scrapped really well in the beginning, and in the second set she started being a bit more aggressive. The woman right next to me was knitting, which I thought was interesting. I guess that’s a good thing to do while watching tennis! In the center of the Billie Jean King National Tennis Center, right in front of Ashe, there are two beautiful fountains. I sat by those fountains for about fifteen minutes, watching Venus’s match and Sloane’s match simultaneously. On Court 7, Konjuh vs. Barty was starting up so I decided to head over there. WOW Konjuh hits hard. And it seems so effortless too! Barty was picking up some momentum towards the end of the first set. I left after Konjuh secured the first set, and later as I was walking past Court 7 again, I heard “Game, set, match Barty” and I got really confused. In the end the scoreline was shocking, as Barty dropped just one more game in the rest of the match. In the next hour, I stopped by Court 13, where Ekaterina Makarova was playing Mona Barthel. Makarova was just so solid, and she came up with a few stunning net plays. Barthel committed tons of errors towards the end of the match. I also stopped by Court 10 during the first set of Oceane Dodin vs. Pauline Parmentier. Dodin seemed to be getting her game together, as she went from 0-4 to 3-4, but it wasn’t enough and Parmentier closed out the first set. My best experience of the day was probably on Court 11, where Mirjana Lucic-Baroni was taking on Monica Puig. The sun had gone down, and there was a great crowd gathered around the court. I arrived at the beginning of the third set. Both players were crushing the ball back and forth, and it was entertaining until the very end. The crowd was almost completely on Monica’s side, and although I wanted Monica to win, I felt bad for Mirjana because some of the people in the crowd were kind of rude. The third set was a complete rollercoaster, as both players had trouble closing out games from 40-0 up. Full credit to Mirjana though, because it seemed like she really conquered her match-point woes in this match. Even though I have been coming to the US Open for the last five years, I have never seen Maria Sharapova play. Tragic! This year I thought I would have the chance, but the luck of the draw put her against Halep, which HAD to be a night match. 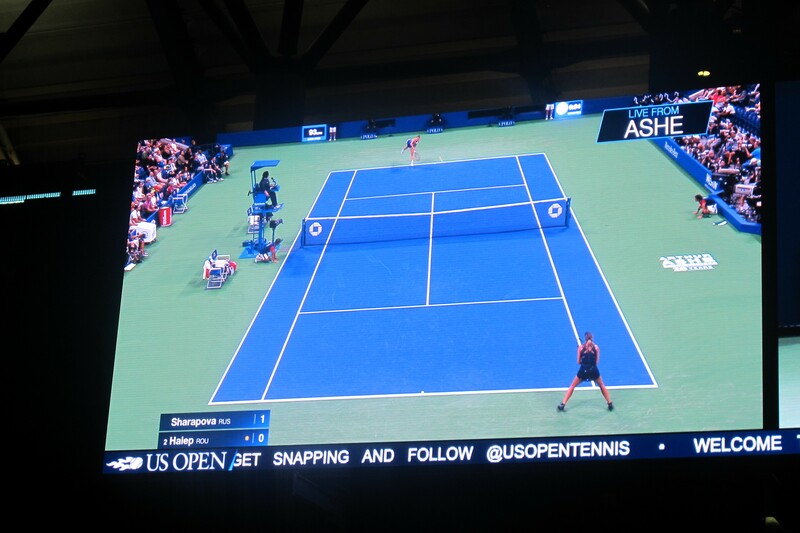 Unfortunately, the closest I got to the Sharapova Halep match was by watching it on the big screen outside Ashe. I had a great time this year, but I have to say that I was exhausted in the end! There is so much going on during the first few days of the US Open every year, and it is really one of the best tournaments in the world. I think every tennis fan should attend the US Open at least once. It’s really worth it! August 31, 2017 in Guest Post, Tournament Report, US Open, WTA. Thanks for this post, it is excellent (good pictures too). Certainly does sound like you had a great time.